An MMU/BBC music and film project exploring race and media representation with young people. More details here. For more research details (including the full film), please visit the Project page at MMU’s Critical Race and Ethnicity Research Cluster. My book from this project is called Alternative Education and Community Engagement: Making Education a Priority and was published by Palgrave Macmillan in 2014. As a result of the Making Education a Priority conference, above, the communities who attended wanted to explore the possibility of strengthening their supplementary school provision across Manchester by creating a hub of schools. The hub seeks to work in partnership with schools, universities and culture providers to raise educational aspirations in their communities. For more details please visit our website here. For more research details, please visit the Project page at MMU’s Critical Race and Ethnicity Research Cluster. 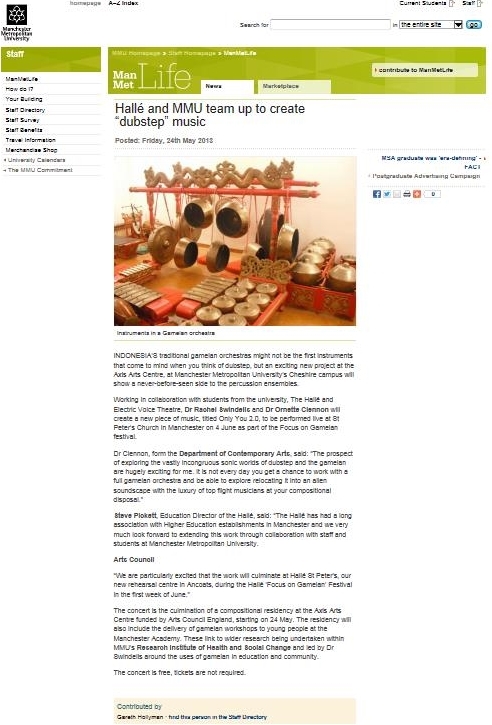 This was an Arts Council funded residency at the Axis Arts Centre (Cheshire) where I wrote a dubstep gamelan track for members of the Halle Orchestra, Frances Lynch and members of Electric Voice Theatre, Live electronics (Guillaume DuJat des Allimes), MC Hypes and of course Dr Rachel Swindells and her amazing gamelan orchestra. 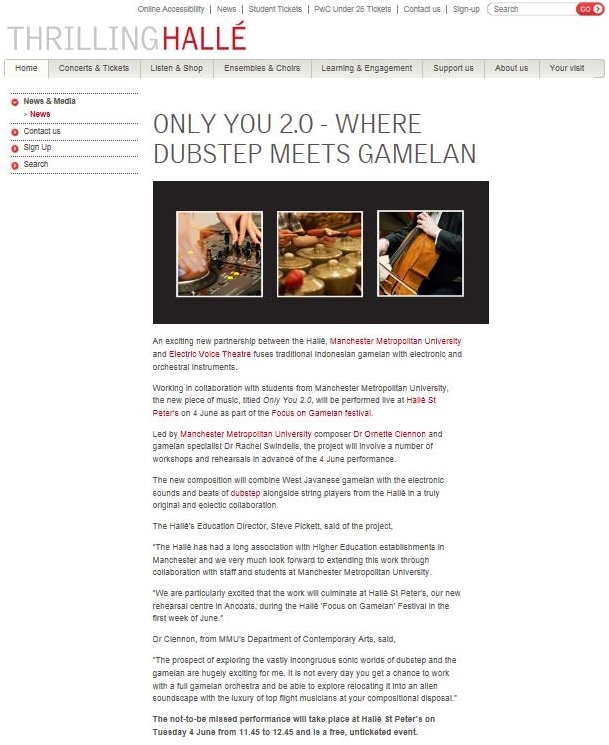 We premiered the piece as part of the Halle’s Focus on Gamelan Festival which celebrated their move into their new Halle St Peter’s venue. Workers from the Sherborne Bungalow Youth Club by Young Musicians for Heritage Project. A participant (a young youth leader) from the project by Young Musicians for Heritage Project. The Buzzin’ Group by Young Musicians for Heritage Project. Some more music from the project by Young Musicians for Heritage Project. Some drama from the project by Young Musicians for Heritage Project. You can read our paper from this project here. For more outputs from this extensive project please click on the picture. Reson8r was the name of our cross university research team comprising researchers from Oxford Brookes University and University of Staffordshire. We were commissioned by Make Some Noise, in partnership with the Staffordshire Neighbourhood Policing Unit and Staffordshire Children’s Services, to conduct some research into finding out whether music workshops could change young people’s attitudes towards offending behaviour. Here is some of the music that our young people wrote. This was a mental health residency that I led at the Abbey Hulton Clinic, North Stoke CAMHS. The young people wrote songs that explored different aspects of their mental health and wellbeing. We also measured their attitudes towards their self image (SIP) before and after the residency. This was a music technology project that I led, which was part of the award winning Sonic [db] Music Technology in Prisons project, initiative. Using music and creative writing, this project looked at the inmates’ attitudes towards their offending behaviour, which included examining issues such as homophobia, misogyny, drugs and gun crime. This Lottery-funded residency with my community education enterprise, Revelation Community Arts, involved adults with learning difficulties writing their own tracks and directing and filming their own music videos. This film was premiered at Edinburgh’s Filmhouse cinema. – I have led music workshops across a vast range of communities. – I have also delivered staff CPD training in using music as an outreach tool for communities and a therapeutic tool for workshops in Special Needs units. – I have also led music workshops which formed part of self-advocacy programmes with adults with learning disAbilities. See Longstone Masterpieces (2000) Produced by Revelation Community Arts Edinburgh: Longstone Resource Centre Available at: http://youtu.be/w_E-9uXd3yk [Accessed: 12 Feb 2013]. See (1996) ‘Revelation’ helps city adults look in Available at: http://wp.me/p3b6I0-m [Accessed: 12 Feb 2013]. See Miller, M. (1991) Party Atmosphere.The Scotsman, Wednesday December 18th. [Hidden Song for string quartet] Available at: http://wp.me/p3b6I0-10 [Accessed: 13 Feb 2013]. See Wiggins, G. (1995)One Voice: Conflict and Unity Concert Available at: http://wp.me/p3b6I0-cI [Accessed: 3 Nov 2013]. See Wiggins, G. (1994)One Voice: Concert for Rwanda Available at: http://wp.me/p3b6I0-2i [Accessed: 12 Feb 2013]. See (1998) A heartfelt musical tribute to justice Available at: http://wp.me/p3b6I0-J [Accessed: 12 Feb 2013]. See Osborne, N. (1992) A Celebration of Cultures, Glasgow 11 February – 23 April 1991. In Strugnell, S. (ed. ).Scottish Chamber Orchestra Yearbook, 91/92. [Miniature I for Miniature I for chamber orchestra, soprano, mixed voices and monochord] Available at: http://wp.me/p3b6I0-b [Accessed: 13 Feb 2013]. Wye, B. (2011) The Teachers’ Show: Young Musicians for Heritage Project [radio broadcast]Redshift Radio. Sunday August 28th Available at: http://youtu.be/R1opwFaDxok [Accessed: 15 September 2014]. See Editor, (2009) Cash to help pupils engage with music.Buxton Advertiser, Thursday February 19th. Available at: http://wp.me/p3b6I0-40 [Accessed: 12 Feb 2013]. See May, C. (2007) Spotlight. Possibilities: Creative Partnerships East Lancashire – Renewal through creative learning, Iss. 3 p.20. Available at:http://wp.me/p3b6I0-1f [Accessed: 12 Feb 2013]. See Dunne, N. and Haynes, A. (2007)The Art of Looking Sideways: The role of Creative Agent in supporting School improvement. [report] Wolverhampton: Black Country Creative Partnerships. Available at http://wp.me/p3b6I0-2W 23 [Accessed: 12 Feb 2013]. See North Stoke CAMHS (2007) Abbey Tracks [album, mp3] Make Some Noise: Staffordshire Available at: http://youtu.be/zVsFdG1C28w [Accessed: 15 Aug 2014]. See Dillon, L. (2010)Looked After Children and Music Making: An Evidence Review London: Youth Music Available at: http://wp.me/p3b6I0-3z 26 [Accessed: 12 Feb 2013]. See Reson8r Music Research Project (2009) Make Some Noise: Silkmore and Mazeley tracks [tracks, mp3] Make Some Noise: Staffordshire Available at: http://www.youtube.com/watch?v=JCqIv4KBe7Q [Accessed: 12 Aug 2013]. 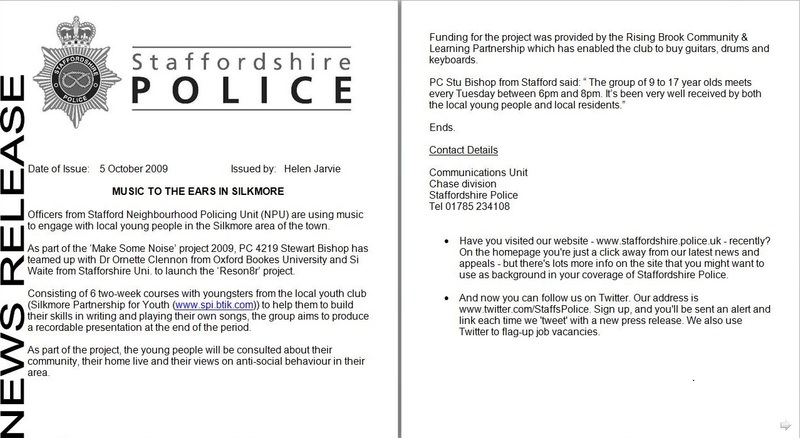 See Jarvie, H. (2009) Music to the Ears of Silkmore [news release]Staffordshire Police Available at: http://wp.me/p3b6I0-23 [Accessed: 12 Feb 2013]. See Lee, M. (2007) HMPYOI Werrington: Sonic [db] Music Technology in Prisons [radio broadcast]BBC Radio Stoke (an inmate, 3:57) Monday July 24th Available at: http://youtu.be/65Hu7vi7Ykc [Accessed: 12 Feb 2013]. See Smith, C. (2007) [Sonic [db] Co-ordinator]HMPYOI Werrington [letter about my work on Sonic [db] Project] Letter to Clennon, O. Sent 7.6.07 Available at http://wp.me/a3b6I0-lu [Accessed: 24 April 2014]. See ENYAN (English National Youth Arts Network) (2011) ”Case Study, Sonic [db] Music Technology in Prisons” In Mendevil, J.M. (ed. ).Youth Arts Transforms Lives – FACT Southampton: Artswork pp. 90 – 95 Available at: http://wp.me/p3b6I0-2P [Accessed: 10 Feb 2013]. 2 Responses to Some of my Projects….